The year started badly for Argentina when the worst drought in 50 years hit the harvest of maize and soyabeans, both important exports. In May a stronger dollar and higher US Treasury yields prompted international investors to flee risky assets. Most emerging-market currencies suffered, Argentina’s especially. 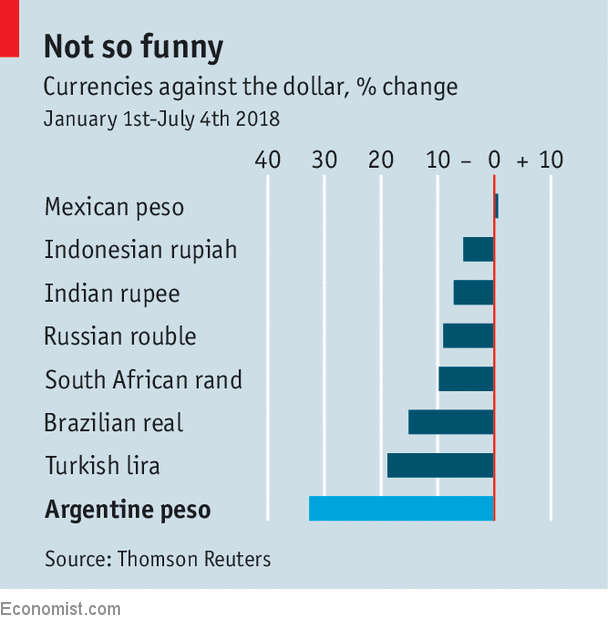 Its twin fiscal and current-account deficits have seen the peso lose more than a third of its value this year, making it the world’s worst-performing currency (see chart). A recession, the fifth in a decade, appears inevitable. In May the central bank hiked interest rates to 40% to prop up the peso. When that failed Mauricio Macri, the president, secured a $50bn credit line from the IMF. The peso continued to fall. On June 14th the central-bank governor resigned, admitting he had lost the confidence of investors. Luis Caputo, a former Wall Street trader, was moved from the treasury to replace him. Mr Caputo has had a tough start: since his appointment the peso has slid by a further 4% and the Merval, Argentina’s benchmark stock index, by 8%. Frustratingly for Mr Macri, Argentina’s travails are, in part, a consequence of his efforts to put the economy on a firmer footing. When he took office in December 2015, inflation was running at 25%. He allowed the peso to float. It quickly fell by 29%. He also gave the central bank freedom to raise rates, which encouraged foreign investors to buy government bonds and supported the currency. It remained overvalued. That kept imports high and made it hard for exports to compete. The current-account deficit rose to more than 5% of GDP. Meanwhile the government raised large amounts of foreign-denominated debt to cover the fiscal deficit. When investors cooled on emerging markets, all that left Argentina painfully exposed.